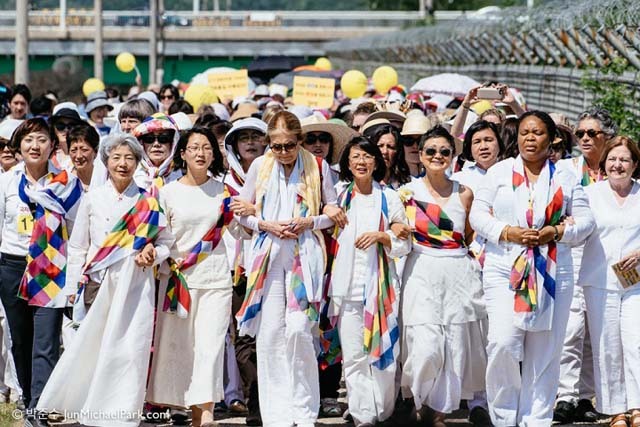 It is with great pride and joy that we received news of the successful crossing of the 2015 Women Walk for Peace in Korea at the demilitarized zone (DMZ) separating North and South Korea. Our very own Liza Maza of Gabriela from the Philippines and the International Women’s Association joined the historic crossing. The WomenCrossDMZ includes feminist Gloria Steinem and two Nobel Peace laureates, Mairead Maguire from Ireland and Leymah Gbowee of Liberia. Even as they are denied to go on foot, the DMZ crossing signifies not only the women’s active role in peace-building. It ushers in a new era where the old Cold War enmity imposed by the United States in the Korean peninsula is being resisted and replaced by people-powered collective action for peace and reunification. It is time for the United States government to sign a permanent peace treaty in Korea and for the United Nations to respect the peaceful reunification of the Korean people. The US has been at war there for over half a century, stationing troops and bases in the south long after the Soviet and Chinese armies have pulled-out after the 1950-53 Korean War. It has no justifiable reason to be there. The US must pull-out from Korea and leave the people to reunite with their families and live in peace. Political pundits and paid hacks of the US who have tried to besmirch the WomenCrossDMZ have failed. Their efforts to use “human rights” to befuddle the issue of peace and reunification in Korea is plain dumb. They could not fool the peoples of Asia and the world who are now resisting US intervention and aggression everywhere. As we laud the smart and brave women who took the risky DMZ crossing in Korea, we also call on all peoples to fight back US military presence in Japan, Australia, the Philippines, and South China Sea. The US sabre-rattling and strong-arm bullying in the region is not helping peace and building a better world. The US imperialist and neocolonial policies remain as exploitative and oppressive as ever to working men and women, white and colored-peoples, developing and undeveloped nations. Systems change must go with regime change. It is up to the Koryu people to take their glorious 5,000-year old history and define their own bright future. We remain supportive of their struggle for peace.